Belle Isle Awning stands behind our customers – before, during, and after the sale. We provide a full range of repair and restoration services to ensure that your awning provides years of enduring and appealing performance. Tears, split seams and stressed fabric can result from many causes, including accidents, uneven wear, and material fatigue. During initial construction, we sew our awnings using flexible, high tensile strength materials that are made to last. We use the same super-strong materials for all repairs, expertly stitching your awning to minimize visible defects and avoid damage to fabric while ensuring a repair that lasts. 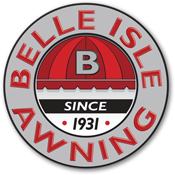 Of course, Belle Isle Awning offers expert installation of new awning systems – but we’re also happy to remove your old awnings as well. We practice the same careful, respectful methods when removing your old awning as we do when installing new ones, ensuring a minimum of disruption and no damage to your building. We’re happy to help keep your awning clean and safe from the elements, expertly removing and storing your canopy in our safe climate-controlled facility and reinstalling it in the spring. Want to fix a minor problem yourself? We’re happy to help. We stock strong, easy to use patching materials that ensure a durable and great looking repair. Atmospheric pollution, rain, plant material, tree sap, rust, smoke and other substances can take a toll on your awning’s great look. We’ll be happy to make it look almost new, using purpose-created cleaners and techniques to remove even the most stubborn stains and grime. We pride ourselves on offering great values to our customers for all of our products and services. We will be happy to let you know what your job will cost up front, with no obligation. Please contact us and we will be happy to provide a free estimate.